Description: Digital image from Kim E. Piersol original 35mm Kodachrome transparency. IHB Blue Island Yard. 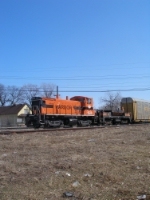 Description: An IHB train behind a switcher and a slug rolls along home rails. Description: 1520 and the infamous slug PB1.